Eriko Kirishima known in Revelations: Persona as Ellen, is a gorgeous student who aspires to become a fashion model or clothing designer. In the Japanese version of the game, she has studied abroad and frequently uses English phrases. Though she is bright, she fails to take life-or-death situations very seriously. Eriko will only appear if the player refuses to let Hidehiko join the party. She runs into the traveling party while exploring the abandoned subway station. Eriko wields one handed swords for melee attacks. Like Nanjō, her choice of long-range weapon is a rifle. Her initial Persona is Nike. 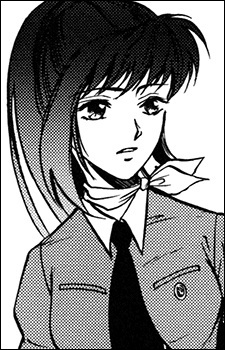 Eriko wears an orange neckerchief in addition to her school uniform.